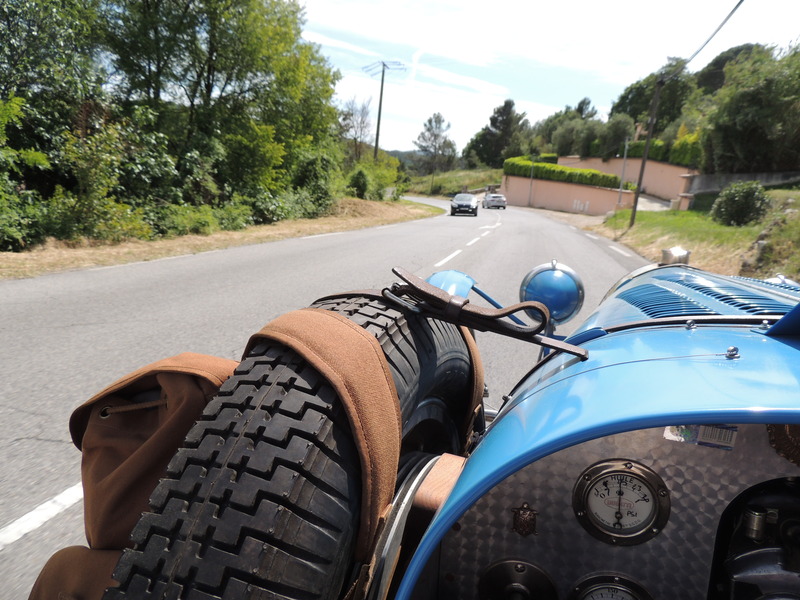 Melbournian Andrew Cannon had generously accepted the scribe’s interest in filling the passenger seat in the 1927 Bugatti T35B/51 on the first leg of his and Adam Berryman’s (1928 Bugatti T37A) drive toward the following weekend’s Grand Prix de Pau Historique. 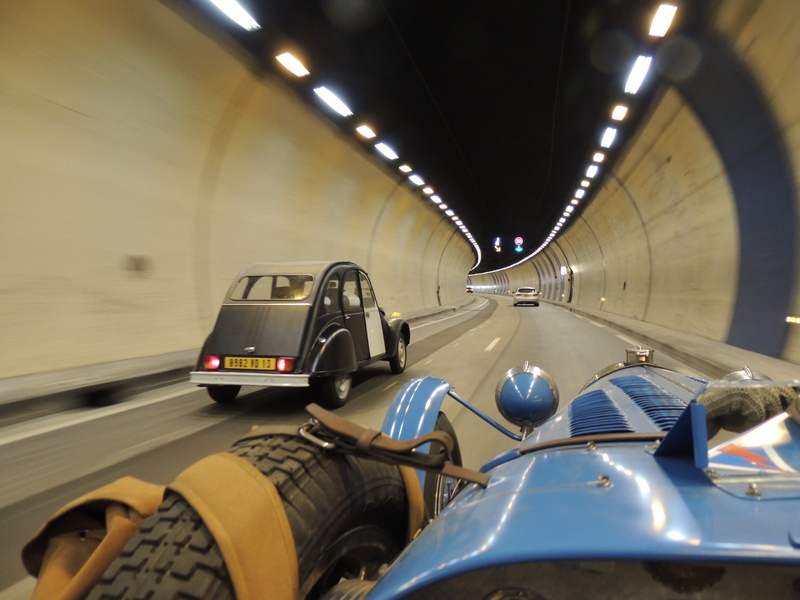 Following a touch of the dashboard mounted St. Christophers Medial & Tazio Nuvolari’s good luck charm; we departed Monaco after 11:00am, navigating our way out of the Principality through a series of tunnels. It was perfect weather for the drive, sunny, although at times a little cloudy. 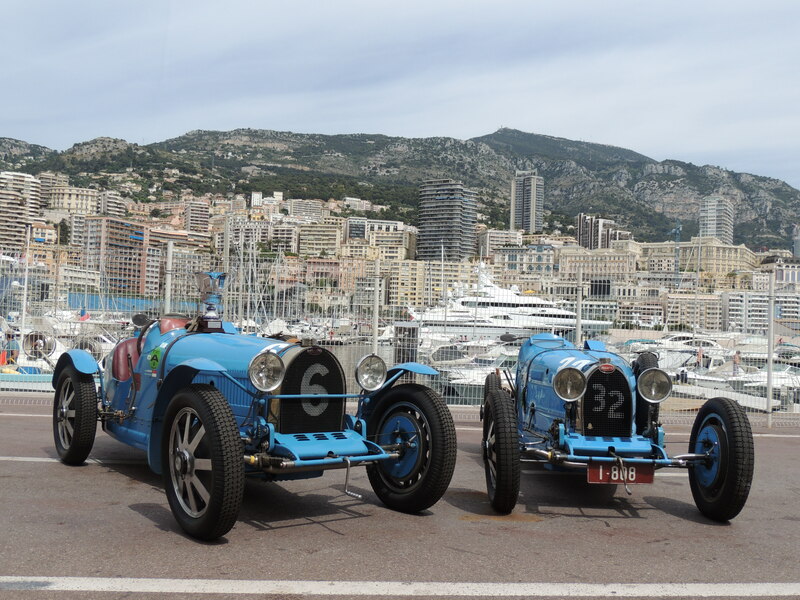 The temperature was warm enough not to wear a jacket in the open Grand Prix Bugatti. Soon we were on the motorway, mainly chosen to get some quick distance under the belt before hitting the country roads. Destination – as far as we could get in daylight! After paying a few toll fees, we exited the motorway and slowed down as we drove through some quaint country towns in the south of France. Leaving a township into the winding hilly roads was a great experience with Cannon hard on acceleration in the twin-overhead camshaft straight-8 engine of the T51. The engine noise under pure acceleration is so crisp, the most crisp T51 engine the scribe has ever heard, more crisp than the T35B engine in Nick Mason’s Bugatti when it was raced at the 2013 Donington Historic Festival. 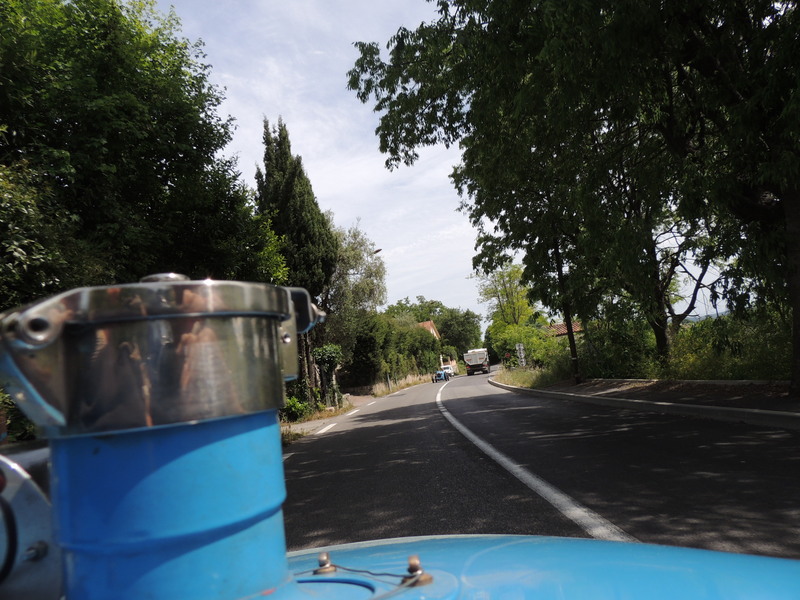 The two Bugattis changed position on the road a few times, once due to a mind lapse for the scribe in his navigating skills missing which turn off the support vehicle had taken out of a large roundabout. Then Berryman (and co-driver Jeremy Mantello) were nowhere to be seen. They had pulled over with clutch problems. This break had Cannon and the scribe sitting in a quiet car on the side of the road near a T-intersection – enough for someone coming to the corner to get past us when turning right on to the road we were on. Not so for French drivers though. They couldn’t quite work out that they could actually go around the Bugatti and not aim for it. With Berryman pulling in behind us we continued on for about another half hour until Berryman pulled off into the car park of a Thai restaurant in the middle of the countryside (called Old Siam Restaurant). Berryman’s clutch issues had continued, and he got to work pulling the clutch to pieces. He found that three of the bolts holding the clutch plate on had broken. Spare were gotten out from the storage spaces beneath the driver and passenger seats as work continued. It was at this point that almost all of us at the same time noticed a puddle of oil under the front of Cannon’s engine. Morris oversaw the inspection, opening the bonnet, but not immediately seeing where the leak was coming from. The car was started and the leak noticeable from oil coming out of a developed crack in a small diameter copper pipe. The car immediately switched off (the last time the scribe heard the engine in France). An elaborate section of copper pipe had shortly before (probably in the last 5 or so minutes of driving) developed a crack. The pipe is a feeder pipe to the supercharger, and it was told that this pipe was an original pipe – never cracked on or worked since this motor was installed in the early 1930s (an upgrade to the original T35B motor to maintain competitiveness in racing). The task now was to locate a workshop that would have the equipement to brase a new piece of copper of the same diameter to the existing (copper pipe would be great too). The support vehicle drove off to find a mechanic workshop, and a place to rest the head for the night. After three attempts, Morris found a Renault service workshop on the outskirts of the Callian township. The car was booked in for the following morning. Two hours later, and after also finding accommodation to house the six of us (in four rooms), the couple returned. Dinner time was approaching, and as Berryman had finished the repair work on his Bugatti, we felt it supportive to have dinner at the Old Siam. After dinner, a tow rope was attached between the Lexus wagon support vehicle and Cannon’s Bugatti with Berryman further back. A slow, but successful drive a few kilometres down the road, then some country lanes past farm properties saw us arrive at the hotel. Cars parked safety and most retired to the bar, although Berryman and Mantello retired for the night. Maps were gotten out to run through plans for the following day’s drive, knowing that the morning would be taken up with the repair to Cannon’s car. As the sun had completely set, Morris decided to get a second wind and chose to do the one-hour removal of the copper pipe task. This was done under supervisory torch holding by his girlfriend Annetta and the scribe. As sun rose and breakfast was consumed, Morris, Andrew and the scribe re-attached the tow-rope and made our way to the workshop, a few hundred metres back on the main road. The Bugatti was pushed into a holding bay outside the main door, the three of us walking in and finding the one person in the business who spoke English. The main question was if they had a piece of the same diameter copper pipe. Initially he came out with the wrong size, which would not be suitable for the application. He then returned some minutes later after going into an old storage area. Here he found an authentic pieve of history. It was relayed the the business was a Bugatti dealership in the late 1920s, and he had located a small length of copper pipe which is thought to be from original stock parts. Andrew and Morris could not believe their fortune at the sight of this with Morris quickly getting all his trusty tools from the support vehicle and setting down to work. The brasing would not take too long, but it was the re-install that would take 1-2 hours. 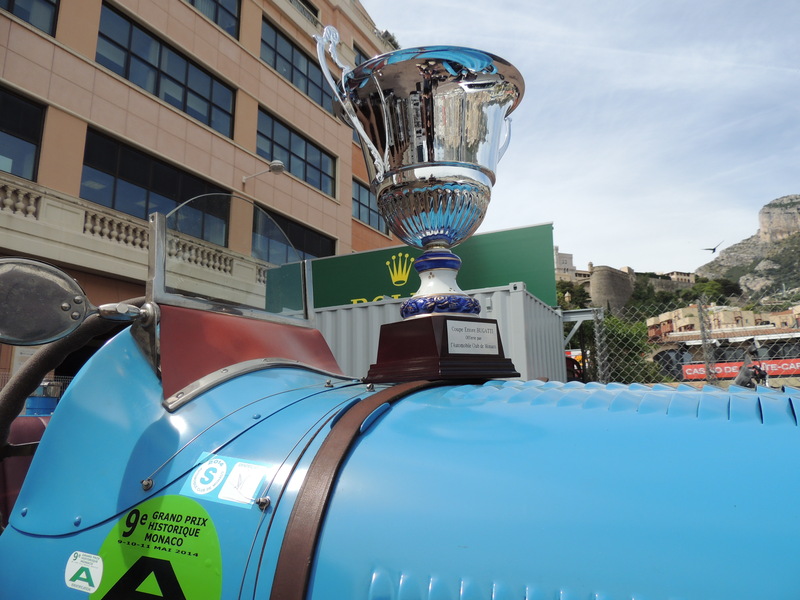 With the scribe having a plane awaiting him at Nice that evening, Andrew kindly offered to drive him to the nearest township with a train connection to Nice, Grasse. 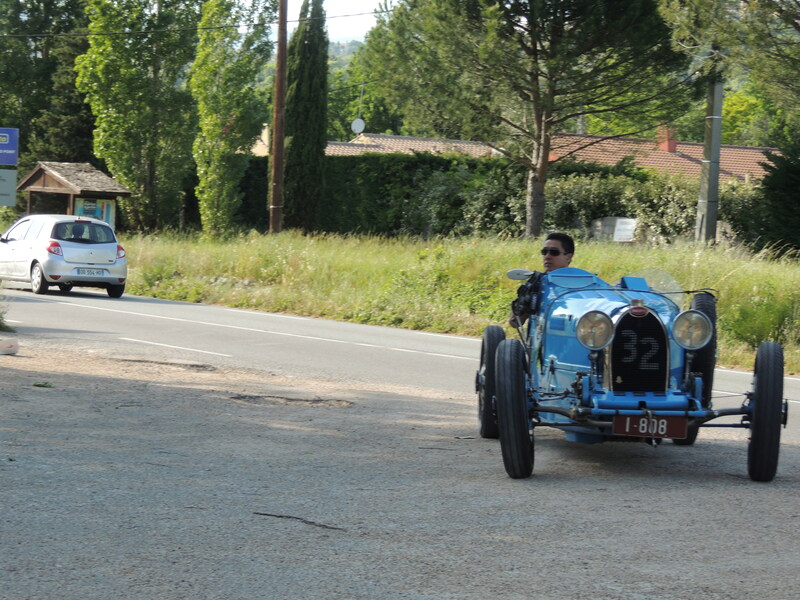 At the eleventh hour, the Bugatti Boys made their way into the township of Pau for pre-race check on Friday 16 May. The Principality of Monaco is most well-known for the Casino and the Grand Prix, but it has a lot more to offer. Many of the tourist attractions are those with a Royal connection. Prince Rainier III was a keen ocean explorer. Many of his findings can be found in the enormous Oceangraphic Museum. The Exotic Garden is another highlight. Then there’s the Palace – tours operate daily, and the adjacent Napoleon Museum. There’s a public beach, and of course the Harbour – there’s two though, the second well worth visiting. That’s also where the Car Collection is.